I could hardly wait to share this update because I am so excited over the progress to reorganize our kids’ craft bar! I’m the kind of excited that would have me talking a little too loudly and rambling on about the changes I’ve made if you were here with me in person. Lucky you! You can just read it as a less-fragmented blog post! This is definitely a quieter delivery. Ha! Here are the steps I’ve taken since my last update. Empty the area completely. This was a little frustrating because it was a repeat. I did this last spring when I started the project, but given the chaos that took over after my progress stalled, it was entirely necessary to do it again. Fortunately, we have open floor space next to the bar, which was covered with the kids’ crafting stuff for a full week! Sort and purge. I couldn’t find a 2-3 hour block of time to focus on this step, so instead I embraced the giant mess, forbid the children from picking through it, and worked in whatever increments of time I could find. Even when I just had 15 minutes, I felt rewarded and motivated to keep going! Decide on the items’ new “homes”. I had decided that the shelf above the desk space would be mine for a couple reasons. First, it’s not easy for the kids to access it. I decided it made perfect sense for my supplies to live on that shelf and have made a “must ask before using” rule. This way, they are less likely to snag ribbon I had earmarked for something special or help themselves to my embellishments! 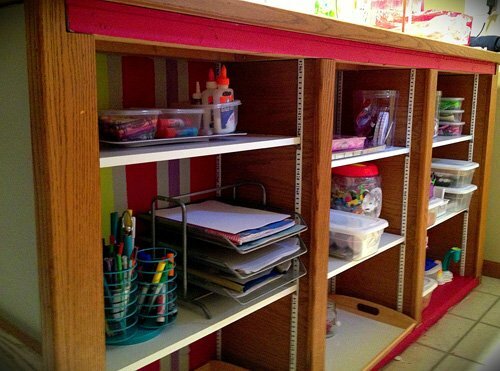 Second, this shelf is highly visible, and it’s easier for me to keep my things neat and pretty than it is for them. Oh, and one more bonus about this arrangement that I didn’t expect? Third, I see my supplies now, and having them move visible is making me want to use them more! Choose storage containers. I mentioned before that I wanted to create a soda shop look for our craft bar, and although I had been saving a lot of plastic containers to re-purpose I had to make peace with the fact that many of them did not work. I initially set up some of my re-purposed containers on the desk behind the bar, which is the second most visible area. You know what? I just hated it. It was nothing like I wanted it to be. 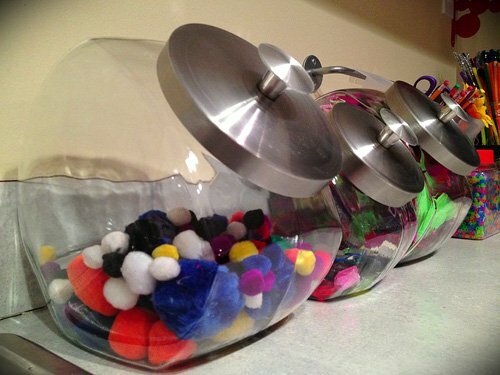 So instead, I snatched up these glass candy jars, and it made all the difference. All the difference! These are easy for the kids to open and close, to rifle through for the perfect pompom or acrylic jewel, and they are super adorable. This is what I had envisioned! I love having their most favorite supplies on display in the most accessible location to them. Put supplies away. I was able to use more of my “re-purposed” container stash to store things on the shelves behind the bar. Aby had a lot of great suggestions as far as where and how to store things. Here is how it looks back there now. So much better! Although everything is organized and stored in its place, I’m not done. Oh no, friends, not by a long shot! Now is when things are really getting fun for me. It’s time to work on labeling and adding some finishing touches. I can’t wait to share the next steps! I do have a favor to ask, though. I could use some fun, fresh ideas for my soda shop theme. When you think of an old-fashioned soda shop or candy shop, what’s the first thing that comes to your mind? Is there any particular color you think of? Style of container? Any and all ideas / thoughts are welcome! Thanks for sharing. Wow! It looks really good! Where are the best places to get storage containers? Thanks, Vivien! I think the best place is the one that has what you need when you need it at a price that fits your budget. I love products from The Container Store and IKEA but but also find great solutions on Amazon as well as Walmart, Target and dollar stores. Sorry not to be more specific! It just depends so much on personal style, specific storage needs and budget! Thanks, SuzieQ! Your description has me craving a milkshake now. Looks good. Color would be a good way to incorporate your theme and the black, white and red is classic with stainless accents. Also, wood and mirrors. I’ve also seen the tall glass straw holders re-purposed as a container for twine, small rolls of ribbon or washi tape. You could find some old 6 pack soda (Coca-Cola) containers to use for pens, markers etc. I’ve seen a lot of vintage inspired soda stuff at Hobby Lobby. Thank you, Suzie12. I will have to plan a little Hobby Lobby visit very soon. Oh my goodness! 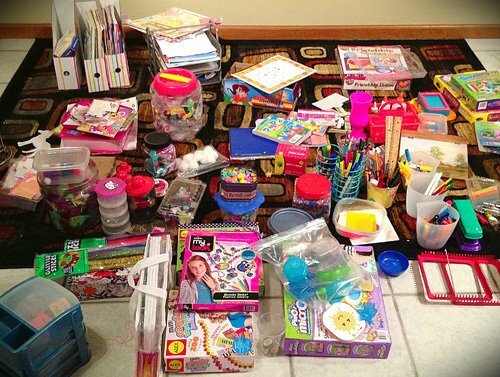 I need to reorganize my kids’ crafting area! I have an open door policy to the craft supplies and it is in a disaster state at the moment!!! You can do it, Julie! It has actually been so much easier and a lot more fun than I expected. Enjoy that project!